In this extraordinary autobiography by Hans Höller, an Austrian born in 1921 near Wiener Neustadt, readers are plunged into an epic journey through the torments of the Second World War. 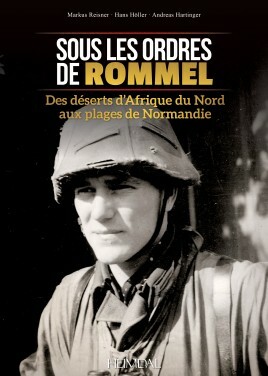 At the age of 20, Höller served as a simple Schütze of the Afrika-Korps in Egypt at the Col d'Halfaya (described by the British soldiers as the "Pass of Hell Fire") and then in Tobruk, Libya. He was promoted to Lieutenant a year later and in the autumn of 1942 he was sent as head of section to Tunisia, and participated in one of the last battles of German troops on the African continent, with the Panzer Division. As a young officer, Höller was ordered to lead an infantry attack, during which he was seriously wounded in a terrifying body-to-body fight against British soldiers. Once healed, he was sent to France for the reconstruction of the famous 21. Panzerdivision, within the Pz-Gren.-Rgt. 192. Commanding a section of Panzerjäger in Normandy, Höller was ordered to take the famous Pegasus Bridge from the hands of the British paratroopers in the very early hours of D-Day. Concealed in a copse near the majestic Chateau de Bénouville, they stopped any English attempt to advance towards Caen along the canal, and even destroyed three Sherman tanks on June 6, 1944. Subsequently, this tough Austrian was occupied with several months of hard Defensive fighting around Caen (Herouville, Cambes-en-Plaine in June), and managed to save the whole of his II. Battalion during Operation Goodwood, at the end of July 1944. In August, he fought furiously near Mount Pinçon, then in the Pocket of Falaise, from where he managed to escape. After a long retirement through France with the few survivors of his section, Höller was ambushed in Lorraine and was captured by the 2nd DB of Leclerc. In these moments of intense anguish, he owes his survival to his arm band "Afrika"! During his hard years, his supreme leader was almost always Erwin Rommel, the illustrious German Feldmarschall whom the Allies had baptized as "Fox of the Desert". Rommel's decisions determined the fate of Hans Höller and each of his comrades. Today at 94, Hans retains incredible health and his memory is fresh. His many personal photographs and poignant, accurate, authentic and even critical narratives offer an unusual glimpse into the experiences of an Austrian young man who, given the moment of the history in which he was born, had no choice but to face them. Text in French.